ATHENS (Reuters) - The European Union's top health official hit out at Greece's deputy health minister for publicly defying the country's smoking ban, saying in remarks published on Tuesday the practice was shameful. 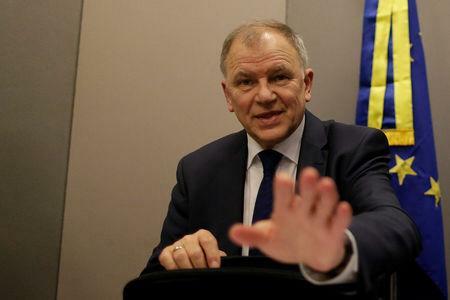 EU Health Commissioner Vytenis Andriukaitis, in Athens to mark World Cancer Day, was asked by Kathimerini newspaper to comment on a 2016 photograph showing deputy health minister Pavlos Polakis smoke during a press conference. He was also asked to comment on video footage, which aired this week, showing Polakis, who is also a surgeon, holding a cigarette while dancing in a club. "It's shameful! It's shameful! This guy knows nothing about health," Kathimerini quoted Andriukaitis as saying. "Whether someone smokes or not is not a matter of free will. When it happens in a public space, it's an infringement of human rights because those around him have the right to breathe clean air," he said. He added: "Today I visited the Greek health ministry and it smelled of cigarettes." Polakis took over as deputy health minister in 2015. Greece, which has the EU's highest smoking rate, bans smoking in all indoor places such as hospitals, schools, airports and bus stations, and requires restaurants and bars to designate smoking and non-smoking areas. Asked to comment on Andriukaitis's remarks, a health ministry official told Reuters: "The minister abides by the EU's and Greece's anti-smoking regulation." Referring to the footage of Polakis smoking and dancing, the official said: "It was a private moment for the minister, a moment of relaxation, and someone video-taped it." In Greece, the cigarette smoking rate stands at 37 percent, higher than the EU average of 26 percent, Andriukaitis said during a speech in Athens on Monday. The EU Commission office in Athens did not immediately respond to a request for comment.